This break barrel rifle by Crosman is ideal for target shooting and pest control and uses a gas piston, single shot mechanism to produce fantastic velocities that lead to laser flat trajectories, unaffected by wind or other environmental conditions. 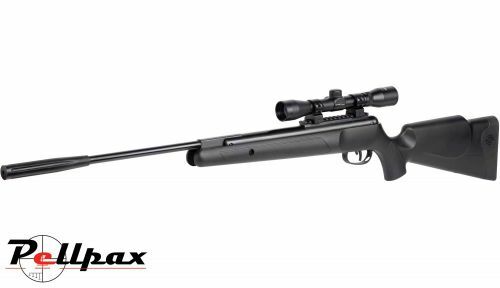 This rifle lends itself well to hunting not only because of its accuracy and power, but also because it is one of the quietest rifles that Crosman make. In fact, Crosman claim this rifle to be 70% quieter than any other break barrel on the market. The ambidextrous stock of the Nitro Venom is made from a durable synthetic polymer with grooves on the fore end for enhanced grip and precision. - Overall Length : 44.75"